Twenty-eight singing bowls were used to create this evocative soundscape. Each track is a spontaneous choreography of holographic sound, using exclusively Alchemy Crystal Singing Bowls. These exceptional bowls are infused with precious minerals, gemstones and metals. The unique quality of the sound expands and focuses the listener’s intention toward balance of body, heart, and mind. Chosen for the different harmonic portals they unlock, each track is grounded in a specific key with corresponding crystal tones that weave transcendent harmonies. Thus the listener can explore the inner world unencumbered by melody or lyric. Read a review of Crystal Bowl Sound Healing from Retailing Insight Magazine. Tryshe Dhevney (Sounds True). This is my favorite CD to play when writing, drawing, or photoshopping piles of photos. 100% organic (no synths), beautifully recorded in a giant natural cave (seriously). Tryshe uses rare customized gemstone bowls perfectly tuned for expanding consciousness via the OM frequency and other well-tested resonances. It’s so good that when I first got the 8-minute track sample for writing the CD package copy, I set it on “repeat” and listen to it looped for hours. Tip: if you download this album, don’t “re-rip” the tracks to make them smaller. You’ll want the highest sound quality to fully experience the effect of the pure, subtle harmonics. I used Tryshe’s CD during the birth of my Son, Sequoia and I will say with absolute confidence that her divine music facilitated an environment that brought such ease and sacredness to my very amazing (and quick!) water birth. I played her CD days before I went into labor and the put it on repeat during labor. It was the first music my son heard when he came out of his comfy and warm place of creation & into our world and I am so happy about that. Thank you Tryshe for gifting us such Divine Music for the most powerful day of my entire life. I have been drawn to the harmonics of the crystal bowls for many years. 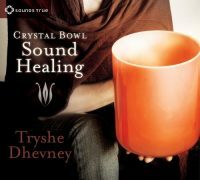 The beautiful sounds on this album CRYSTAL BOWL SOUND HEALING BY TRYSHE DHEVNEY has the truest musical harmony. I HEAR it as a lyrical harmony, which to me is more pleasing than the many crystal bowl albums in my library. I am familiar with their tones, as old friends. However I find this one like a bright light floating in out of the fog. I like it.